Royal Fair now known as Belle is definitely a lucky girl. She has joined a long time member and supporter of GAGC. Edye has adopted several greyhounds from us. 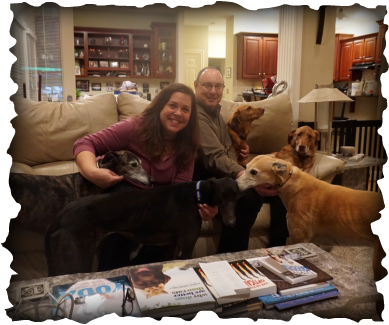 Pictured is Edye and Dave, Rusty and Ruby on the couch, and Belle joins greyhounds Mystic and Sophie! Not pictured was her sweet cat T, who did greyt with Belle. Her pack met Belle one at a time and was thrilled to have her join their family. Sophie who is almost 12 was so funny, she kept bouncing and running around the yard with Belle, it was so cute. Greyt family!